Definitely and yes if I can share that too that would be perfect! More than happy to help test the test too!! 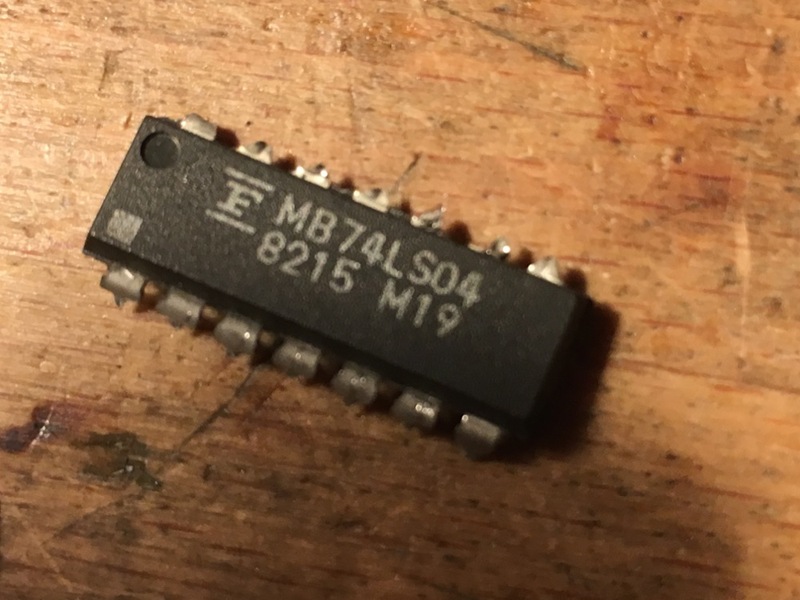 I think socketing RAMs like this is always a good idea, as long as you are confident you can do it without damaging the PCB and causing more faults. It would be easier to quote ram and chip as per the board position if possible :) , as this is what the schematics use and how i and Mitchell have been identifying things. 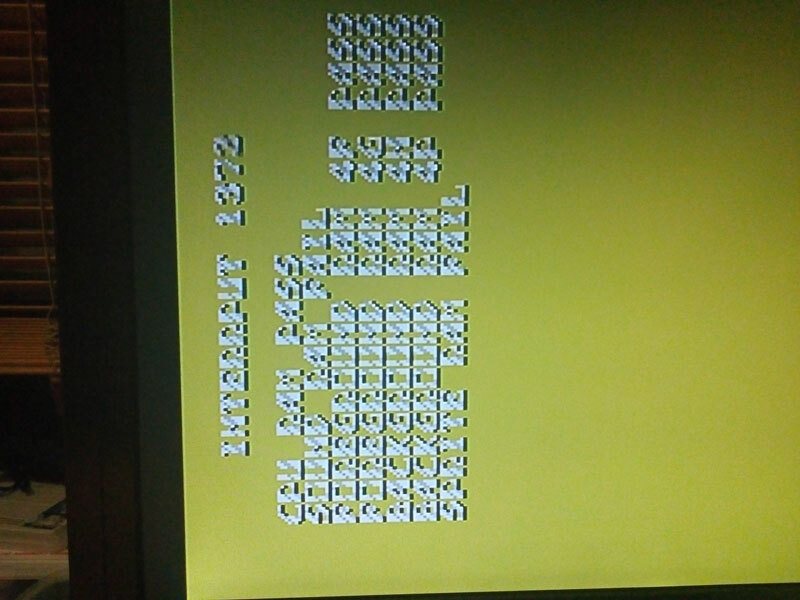 The rom names from mame are weird! I've been on quite a journey with my board since the last update. 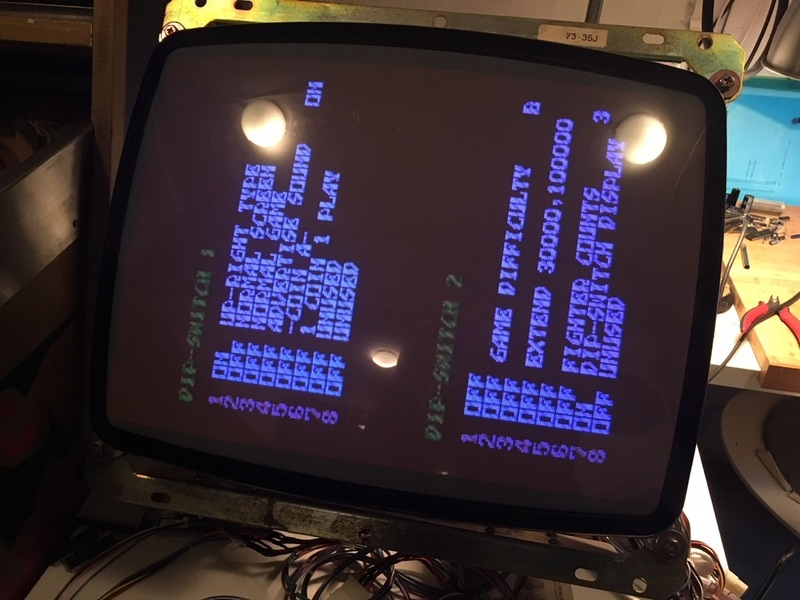 So my board's video issue is now solved and i can now also (with the std game roms) get passed the zero screen and be presented with a text screen message, so i'm pretty happy right now! No more scratching around trying to rsolve the video sync issue or using the screen flip option to see what's going on. Both issues of no visable image in std mode and also no text or characters on screen were both related to the same issue. What i worked out after hours and hours of debug is that there is another difference on my board to the schematics. Yes, another modification/slap right change is needed. 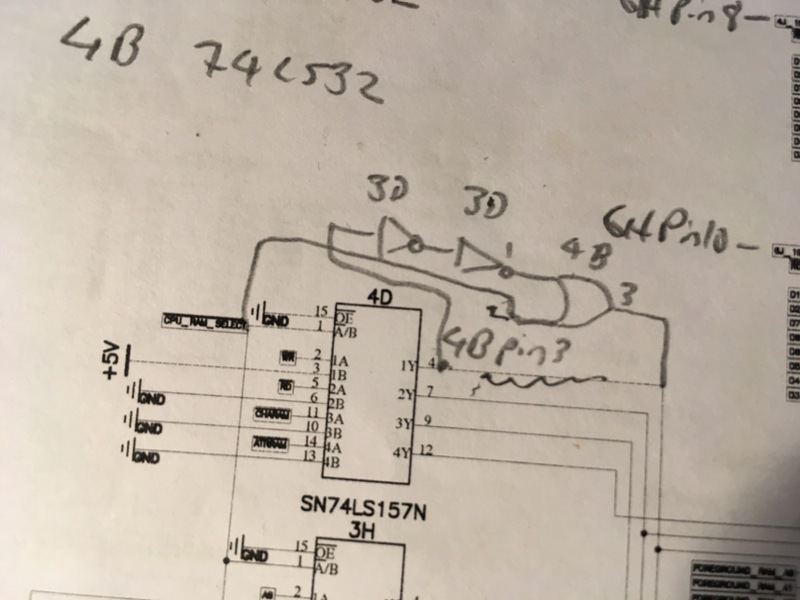 I found that there was no write enable access to the foreground ram chips and when i traced it back i found some inverter gates and an or gate in the logic. Seems that the write enable line is buffered (possibly for timing needs) and as such looks like this. 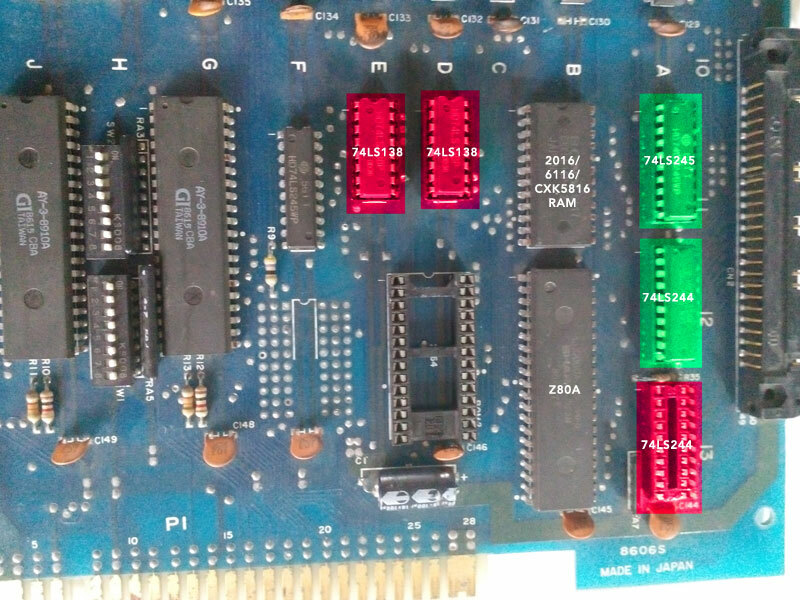 I also found that this inverter chips was a Fujitu brand and i've had lots of issues with these chips dyeing over time (in many other boards). So much so that it is a known idea to just shot gun all Fujitu ics when you have a bust board! More updates. I solved my repeating text on screen issues. There was a broken trace on the board for the enable on 3H. Was hard to spot as traces on these boards aren't great quality. What are the other boards quality like? Some bootlegs i've had before are actually pretty good quality but not this one! 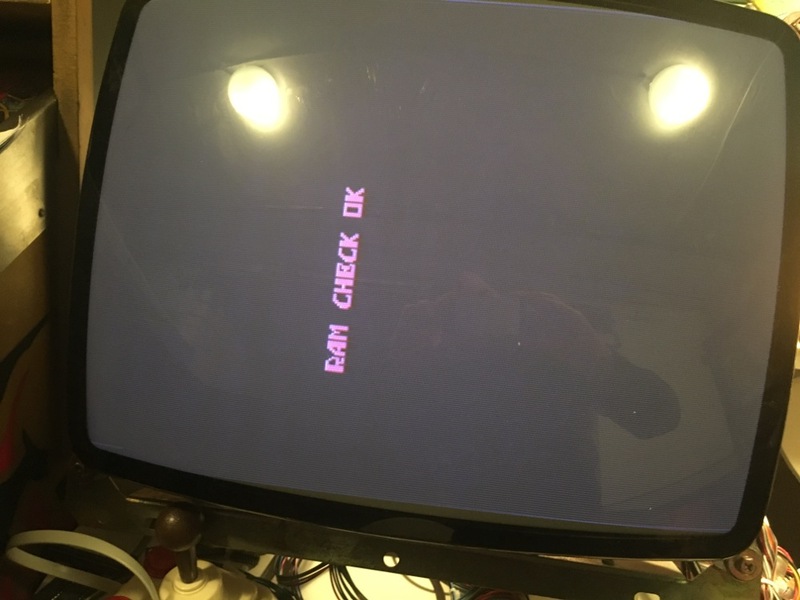 I'm now at the point of trying to work out why the board is stopping at the ram check ok message and not reporting bad roms or rom check ok message. Ahh, that's excellent progress there. 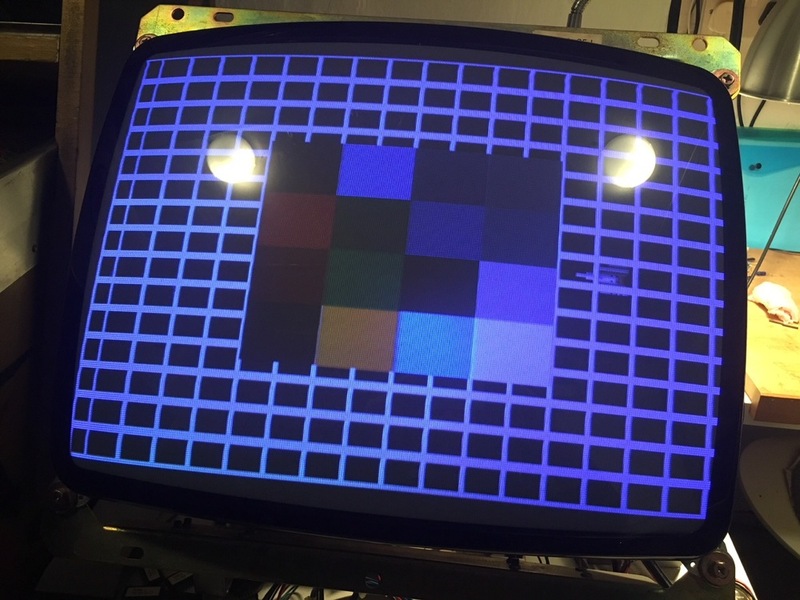 Many thanks for spotting the extra gates in the write signal, no wonder I'm seeing so many problems getting test software to try to run on Tiger Heli when there are yet more hardware differences from Slap Fight. That extra circuit looks quite crude and asynchronous, using the two inverters at 3D back to back to form a delay. Certainly something that could be very sensitive to timing if it were to be replaced by a more modern 74HCT device, or possibly even a same model chip from different manufacturers. I'll check my own Alcon PCB later and also double check Tiger Heli to see if it's missing or not there too. 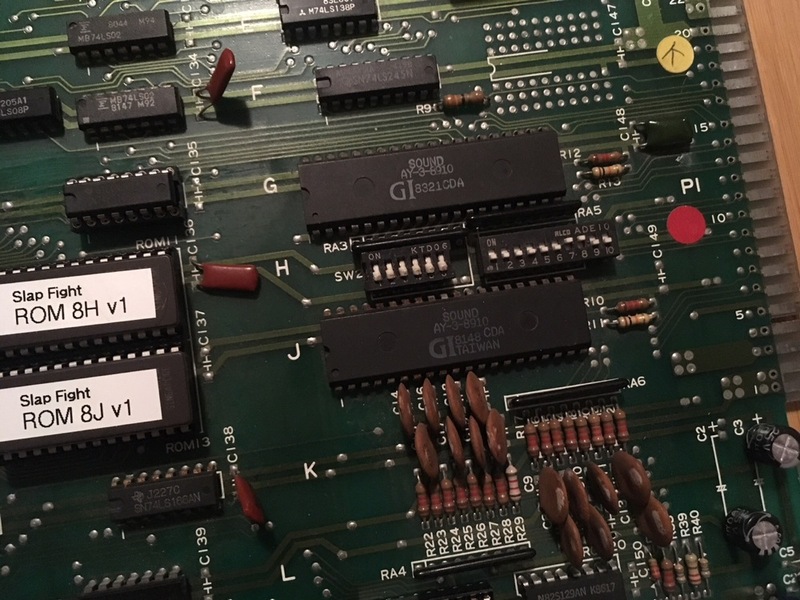 PCB quality seems OK on my set, but I'll have a closer look now you've mentioned it. I have a single Alcon (Slap Fight) PCB and about 4 or 5 Tiger Helis in various states. Multiplexer enable fault at 3H would certainly explain the repeating images! 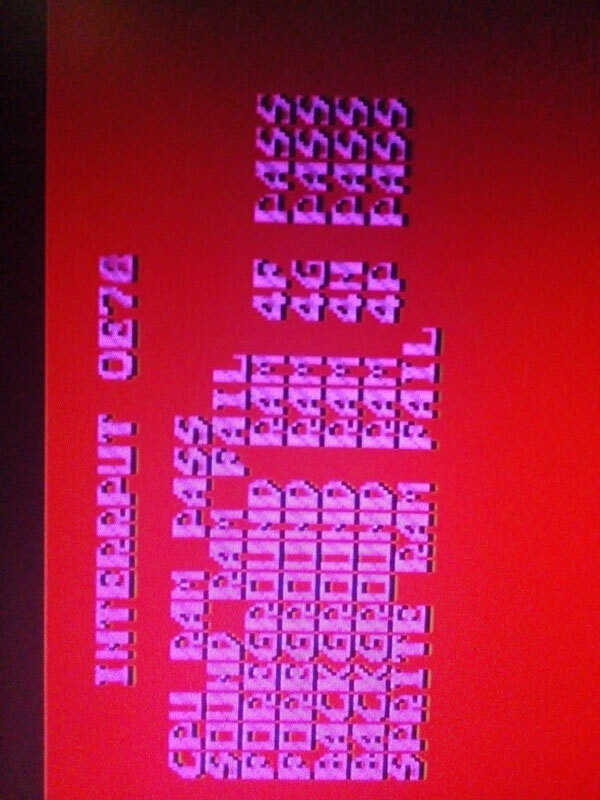 I'll try and look at what could cause the test to halt after RAM CHECK OK if I get chance later. Quick update on my board repair. I've now solved all the issues with it :) and played my first games a days or so ago. Awesome game. 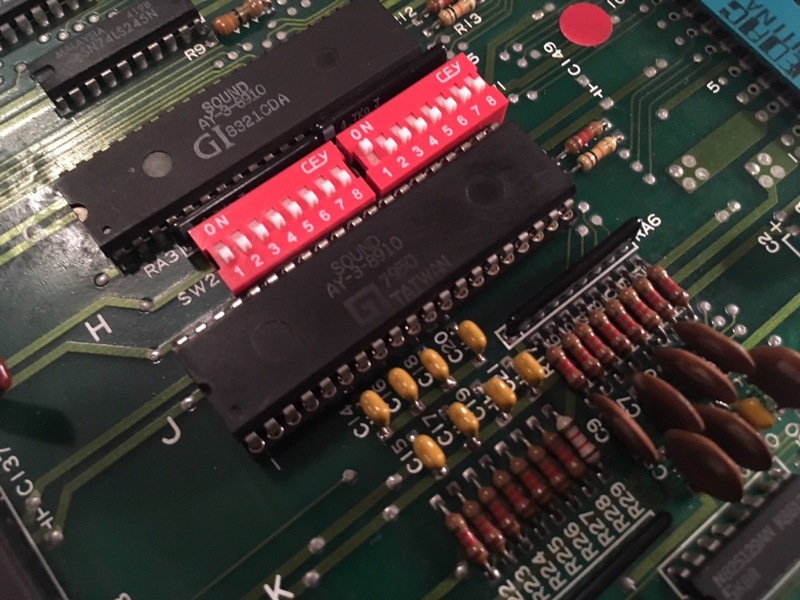 I did some work on the dip switch area and the control switch line caps whilst is fixing some of the faults related to the AY-3-8910 sound generator ic at 11J on the sound/sprite board. The original boaters had installed nasty dip switches that were too short and too long! Also the caps had all seen better days, so i replaced with MLCC instead of nasty cheap ceramic. 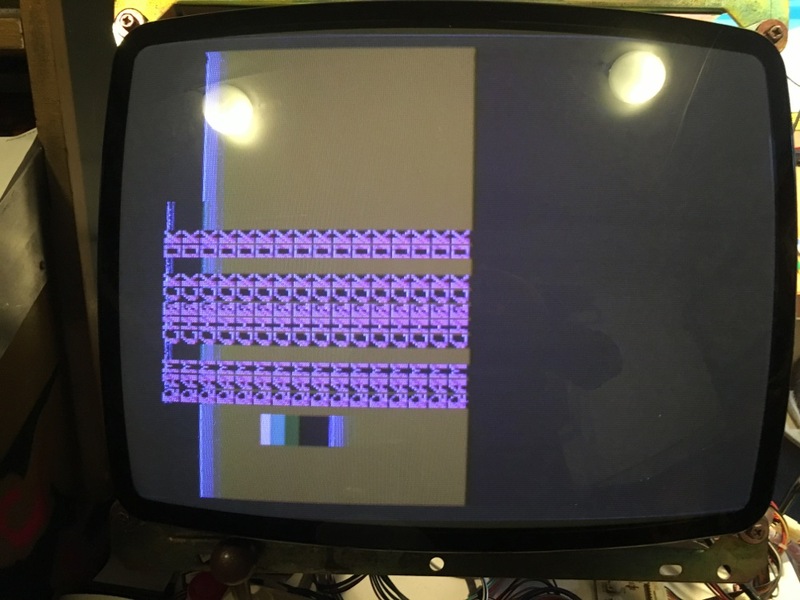 Interestingly the integrated boot test on the actual ROMs hangs at this point too, as it can't return from the RAM check, even though the first reported back result is a ROM test!